This is not the new Mercedes-Benz CLA. 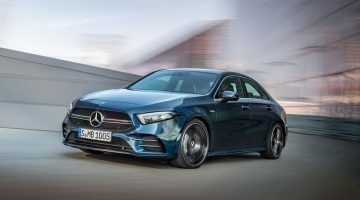 It is the new Mercedes-Benz A-classsedan, which will make its official debut at the Paris motor show in September and hit the roads at the end of 2018, becoming the second member of the all-new Mercedes A-class family. So what is it? Well, an A-class, but in 4-door saloon format. 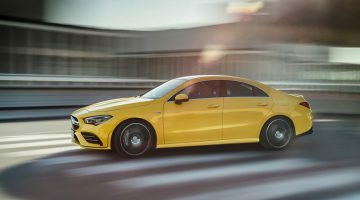 While that does sound rather like the outgoing CLA, it’s slightly different in that jumbled-up way we’ve come to expect of the modern car industry, and there’ll be an actual CLA – more rakish than the saloon – appearing at a later date. Thus the A-class saloon has four doors and a proper boot, it’s 4549mm long, which is 130mm longer than the A-class hatchback, but is the same 1796mm wide and as close as makes no difference the same height. Its 2729mm wheelbase is identical, so don’t expect any more interior volume (the new A is better than the old one in that regard but still not best-in-class), but the sensible roofline of the new sedan should make it more liveable than the old CLA, and Mercedes says it will have best-in-class headroom. Incidentally, the sedan is still smaller than the current C-class, so it shouldn’t tread too hard on the toes of its larger sibling, and the all important bit-on-the-end has 420 litres of volume, 60 litres less than the S-class saloon and identical to the hatch – albeit with a less convenient opening. Mercedes’ biggest claims of the new sedan are to do with aerodynamics however, where it features a coefficient of drag of 0.22 and, thanks to its C-segment positioning, a relatively small frontal area, allowing Mercedes to make the bold assertion that it has the “lowest aerodynamic drag of any production vehicle worldwide”. Aero doesn’t come at the expense of appearance either, and while the sedan’s rump is perhaps a little stubby for the new car to be elegant, Merc’s recent focus on smoother lines gives it an expensive, solid look. Wheels are 16- to 19-inches, depending on trim level – which should follow the hatchback A’s SE, Sport and AMG Line jumps. The cabin, as you’d expect, is effectively identical to the A-class hatch, though Mercedes’ images show it’s possible to specify more than just a dour black and grey combination inside the new model. This should please those looking for something other than the German brand’s interpretation of sportiness. We’re already familiar with the A’s “MBUX” interior tech though. The smallest Mercedes is currently class-leading in this regard, with voice-activated functions that actually work, a responsive touchscreen (that admittedly requires some expense above list price to be enjoyed at its largest and most feature-packed) and a refreshingly pared-back cabin design that ditches large slabs of plastic dashboard for an airier feel. Engine choices will be few at first – just the 161bhp 1.3-litre four-cylinder petrol and the 114bhp four-pot diesel also seen in the hatchback, badged A200 and A180d respectively. Of these the diesel would be our pick, since the petrol gets harsh at higher revs and feels no smoother nor quicker than the diesel in real-world driving. 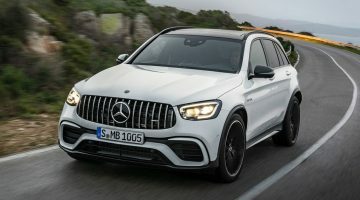 Enthusiastic drivers will have to wait for the inevitable arrival of first an A250 2-litre petrol (punchier, smoother than its smaller counterpart and quicker than both other options) and later AMG A35 and A45 options likely to migrate from the hatch – the first developing around 300bhp, the second almost certainly more than 400bhp. Previous Article[Longterm Update 2] The new BMW 6-Series 640 GT.